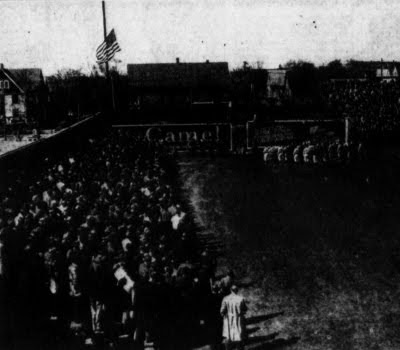 Milwaukee was full to bursting with baseball fever, and the Brews were looking forward to a record turnout at Borchert Field for April 29th's Opening Day game against the Toledo Mud Hens. 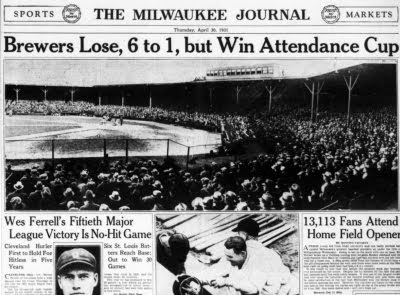 The BrewerRooters didn't disappoint - 13,113 fans jammed themselves into every square inch of the old ballpark, the largest Opening Day crowd in Milwaukee baseball history. Unfortunately, they would all go home unhappy as the Mud Hens hammered the Brews. This picture, taken by a Journal staff photographer, shows part of the crowd of 13,000 that watched the Brewers and Toldeo Mud Hens open the season at Borchert Field Wednesday afternoon. It is that part of the crowd in the temporary bleachers in left field. The picture was taken after the two teams had goose stepped to the flagpole where, just before the start, the flag was raised. That must have made a very short porch to left, considering that the left field fence was only 267 feet from home plate without the added bleachers. That appears to be about a dozen rows of additional seating - figure about three feet deep for each row and suddenly the left field fence is only 230 feet away. Tempting target. 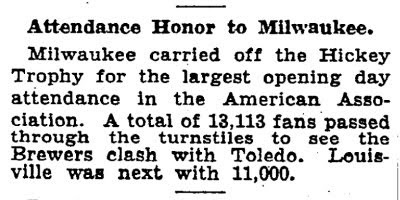 Although the Brewers didn't win the game, the tremendous Opening Day crowd did win the 1931 Hickey Cup for Milwaukee. 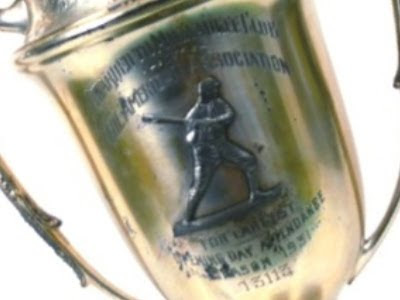 Named for Thomas Jefferson Hickey, one of the founders of the American Association and at the time still its reigning president, the Hickey Cup was awarded annually by the American Association to the club with the largest Opening Day attendance. 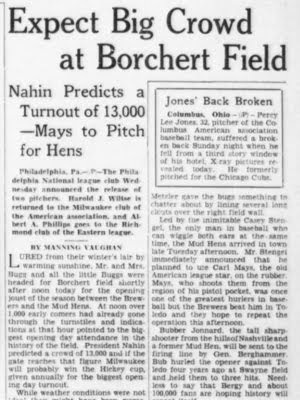 The Cup itself sat in the Brewer office until Bill Veeck dragged it out in June of 1942, incensed that his opening day crowd of 15,599 was deemed lower than the 12,242 Indianapolis drew to their first game (the American Association calculated attendance on a per capita basis, Milwaukee's 2.6% to Indy's 2.9%). 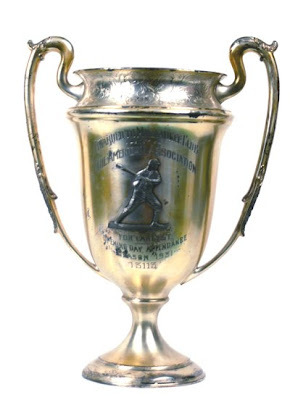 Veeck bought the Brewers a massive trophy and, in a pregame ceremony at Borchert Field, offered the relatively tiny 1931 Cup to the wartime tin drive. This was of course only one of Veeck's legendary "gags," and the 1931 Hickey Cup was spared the recycling bin. It survives today in the collection of Paul Tenpenny, a testiment to Milwaukeeans' love for their Brewers. Great post, Chance! 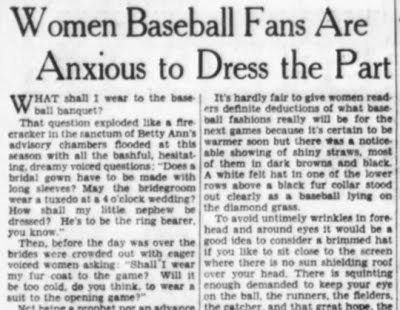 I'm always impressed with the major-league quality of what was then a minor-league city's newspaper. They've got some great layouts for the Packers in the early '30s, too.